Two men were arrested in Genesee County after allegedly swiping two TV's from Geneseo Walmart and fleeing cops. 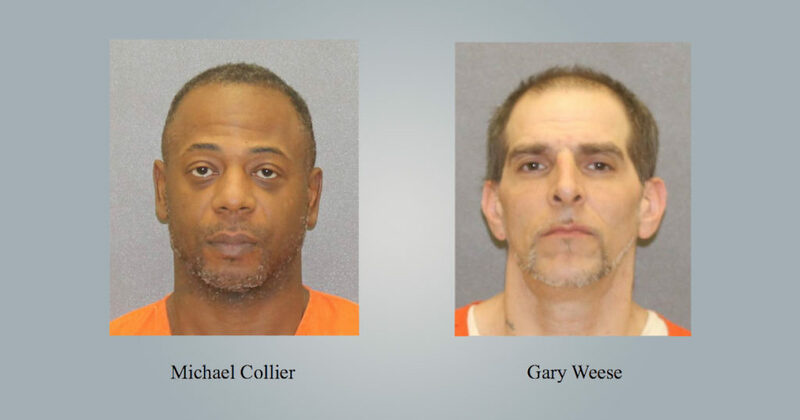 GENESEO — Two men were arrested in Genesee County after allegedly swiping two flat-panel TV’s from the Geneseo Walmart and fleeing cops. According to a press release from Eric Osganian, Village of Geneseo Police Chief, his office arrested and charged Michael Collier, 45, and Gary Weese, 44, with Unlicensed Operation 2nd, Speeding, Failure to Stop, Unlawful Fleeing a Police Officer, Unlicensed Operation, and Unregistered Motor Vehicle for allegedly stealing the flat panel TV’s and fleeing police back on April 5th. The duo is accused of stealing three flat-panel TV’s from the Walmart, valued at $864, where they then fled Geneseo Police and were later caught in Genesee County after crashing their car and a K9 search. They returned back to Geneseo in cuffs on April 10th where they were arraigned in front of Geneseo Justice Thomas Bushnell and remanded without bail.